Twittelytics LITE is a nice Windows 8 Twitter Client app. This app makes it much easy for you to access your tweets, direct messages, mentions, and favorites. 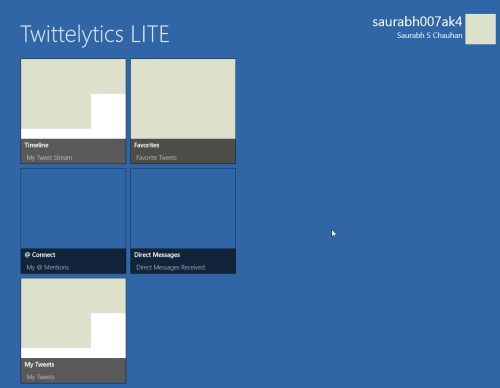 Twittelytics LITE can be easily located under ‘Social’ section of Windows Store. The application is really simple and quite easy to use. This Twitter client Windows 8 app brings you quite complete twitter experience on your Windows 8 machine. Dynamic tiles for viewing your twitter Timeline, your Tweets, favorites, @Mentions, and Direct Messages. Each tiles refreshes after some time to display avatars for last 12 persons who tweeted. You can Tap/Click to view complete timeline. Also, you can select particular Tweet for viewing its details. 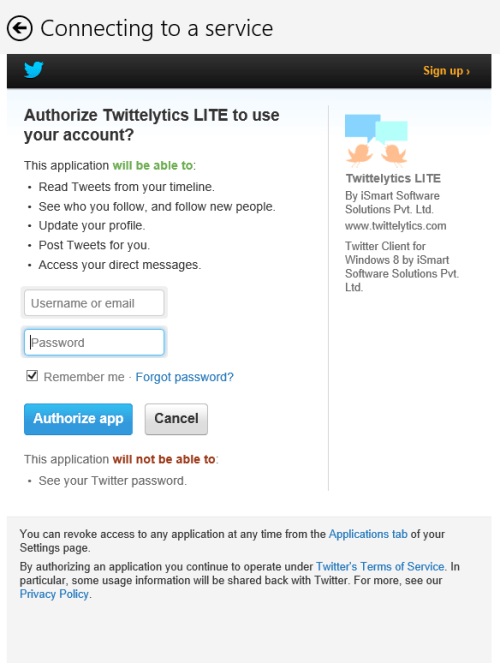 On launching Twittelytics LITE for the first time you will be presented app authorization window. Your task will be to enter valid twitter credentials and click on blue ‘Authorize app’ button. Next, you will be taken to the main application Window showing buttons with headings ‘Timeline’, ‘Favorites’, ‘@ connect’, ‘Direct Messages’, and ‘My Tweets’. Now, you can click on appropriate button to take further action. On clicking on Timeline you will be shown the feeds from your twitter timeline. Under favorites you will find the tweets that you marked with a star. @ connect button fetches you the tweets in which you were mentioned. After clicking on Direct Messages, you will be able to send message to anyone following your on twitter. You will be able to message anyone; just your followers. Also, check out our posts on Social Networking Apps, Facebook Client Apps, and Instagram Client Apps. To install Twittelytics LITE, open this link in IE10 or advance. Now, you can click on ‘Install’ button to download the app now. Its only 1.55 MB in size and will install within seconds. * The app requires permission to access to aces your internet connection. Twittelytics LITE nice, it’s simple, add free, and is quite convenient to use. You can also try Tweetro Windows 8 App as well.